Nor-Tech created a scalable, low-cost data processing system to assist in testing the effectiveness of designs for reducing commercial jetliner noise during takeoff, landing, and sustained flight. A handful of companies worldwide are developing this cutting-edge technology, and using it to build better, quieter aircraft. A multinational aerospace and defense corporation is committed to minimizing the environmental effects of aircraft noise from government, commercial and private aviation. In their efforts, special attention is paid to takeoffs, when engine noise is loudest, and landings, when the sound caused by airflow over the frame is most noticeable. However, engineers at their labs are concerned with all aspects of airplane noise, including interior noise in the cockpit and cabin, noise and reverberation related to aircraft components and ambient sound quality, as well as the aforementioned noise produced by the engine and airframe. Takeoffs and landings are of particular concern because the aircraft is closest to populated areas where environmental considerations are greatest and related liabilities are highest. They needed a scalable, low-cost data processing system to assist in testing the effectiveness of designs for reducing commercial jetliner noise during takeoff, landing, and sustained flight. As part of their noise-reduction efforts, the researchers test new technologies designed to reduce the level of noise generated by its aircraft. Measuring the effectiveness of the designs requires a flexible, accurate, and scalable test system to perform phased array acoustic imaging. A crucial component to the solution is data capture and processing. Hundreds of microphones in a phased array are used to capture the noise and send it to be digitized and processed. Nor-Tech provided three ruggedized Portable Clusters to aid in the processing of the acquired digital data, which is sent over a network to the clusters, enabling engineers to rapidly process test results. This process allows them to pinpoint the sources of noise and either decrease levels or eliminate them altogether. During testing, noise data is typically recorded for approximately 10 seconds. The data is then digitized to disk and processed by Nor-Tech’s Linux powered HPC clusters. A ten second recording with an 91.2 KHz data bandwidth using an array of 600+ microphones equates to about 5GB of data. Such a high rate of data per second requires an enormous amount of RAM and processing power. Intel Quad-Core Xeon E5620 processors power the clusters’ 80 CPU cores. 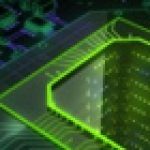 The processors provide extremely high FLOPS per watt to allow for higher performance and offer 3-channel memory bandwidth, which combined with the latest DDR3 memory, provides very high memory benchmark results. Internode communication is handled by QDR InfiniBand with transfer rates of up to 40Gb/s. IPMI built into each cluster allows engineers to do preemptive monitoring of the clusters which enables correction of hardware faults before they cause system downtime. In order to simulate a full-size aircraft subjected to full-scale wind speeds, testing is often done in pressurized wind tunnels, as well as static engine test stands, and air fields all over the US and in the UK. 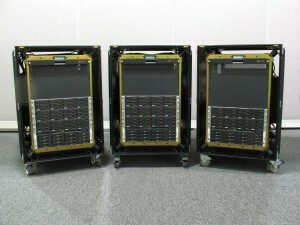 Nor-Tech’s clusters are housed in lightweight, shock-mounted cases and shipped in custom-built, padded crates. This high level of ruggedization ensures the equipment can endure the rigors of travel to multiple destinations by various modes of transport, and still perform as expected. Nor-Tech’s clusters also feature large RAIDs, for increased storage functions and reliability. This is particularly beneficial when testing at remote locations and researchers need a place to safely store vast amounts of data, while keeping it readily accessible. The portability of Nor-Tech’s clusters provides researchers in the field with dedicated resources that are comparable in power to the static equipment back at their data center. Access to such processing capability permits them to immediately and expediently process voluminous amounts of data and generate feedback based on the results while still in the testing phase. This efficient use of time and resources is also an optimal use of expensive test programs. Concern about the environmental effects of aircraft noise is of particular importance to the air freight industry, whose planes routinely takeoff and land at night, near populated areas. Many communities that surround airports have ordinances which establish limits for aircraft noise, often specifically for overnight operations. By studying and minimizing noise emissions, the aerospace and defense corporation is able to build aircraft that are compliant with the standards and regulations of their customer’s sites, and serve a wider market.